Dark theme support seems to have become the latest trend and it’s quickly catching heat. App makers have started embracing it with open arms, including Google, and now it looks like WhatsApp may finally join in on the fun with its own dark mode. Yes, you heard that right. WhatsApp is said to be working on a dark mode for its popular messaging app. It appears like WhatsApp is finally taking cues from its parent, Facebook, which introduced a dark mode for Facebook Messenger earlier this year. If we are on the topic of dark themes, there’s no way we can give Google apps a pass. The Search Engine giant has already started painting most of its app all-white while providing users the option to switch to a darker theme. We have seen this trend with YouTube, as well as Android Messages, and Gmail is expected to be the next in line. Besides catching up with Google’s initiative, WhatsApp’s dark mode is probably being introduced to reduce a battery’s energy whilst using WhatsApp. As one research said, dark themes or modes save battery life. Or simply, the dark mode is being introduced to reduce eye strain at night for WhatsApp users. 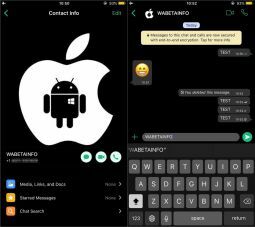 The dark mode will also eliminate the need for modded apps that are like WhatsApp GB which offer dark themes. There is not a defined timeline for the rollout of the dark mode on WhatsApp just yet, but expect it to roll out very soon.